The book was however a fabrication, and ‘Magaret B. Jones’ did not exist. (The author’s duplicity was exposed by her own sister.) ‘Jones’, as it turned out, was the persona of Margaret Seltzer, a thirty-three-year-old white woman living with her daughter in a four-bedroom 1940s bungalow in Eugene, Oregon. Seltzer had grown up with her biological parents in Sherman Oaks, California, and had attended a private Episcopal day school. She did not have a black foster mother whom she called ‘Big Mom’, nor foster siblings named Terrell, Taye, Nishia, and NeeCee. 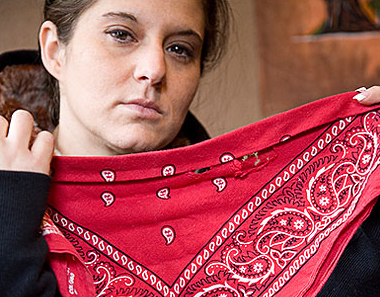 She was neither a Blood nor a Crip. An she had not, at fourteen years old, received a gun as a birthday gift. Seltzer wrote a great deal of the book at a Starbucks in Los Angeles.